I think I’ve post-mortem-ed my RPM album to death, but I did want to talk a little about the final release. The official release is, of course, on my Bandcamp page, alongside my compilation album of older tracks, sketchbook: vol 1. At first, I had the album available only as a free download, but after receiving a bunch of positive feedback, and discussing it with some of my fellow open-source musicians, I decided to make it a pay-what-you-want download, with a $0 minimum. The sales figures so far have been a very pleasant surprise. To be honest, any sales at all would’ve been a pleasant surprise — I’m just happy when people bother to download my work at all — so I was very glad to make enough cash to buy a nice plugin or two (right now I thinking about Loomer Aspect). Out of interest, I also looked in to what it’d cost to produce physical copies to sell. CDs aren’t too expensive to get made — CD duplicators just burn CD-Rs, so it’s cost-effective to make even very small quantities, like 20-50 discs. Even so, I don’t think I’d be able to sell even a small run of CDs; I really like my CD design, but I don’t think a CD is special enough to really warrant the cost increase over a digital download. If anyone does desperately want a CD copy, let me know! I’d be happy to make a few more by hand, even if the disc is still just a plain CD-R with the name scrawled on it. Vinyl would be far more awesome, but it’s also far more expensive because of its up-front costs; the absolute smallest practical run size is 100 discs, at about US$1200-1500 total, which is far more than I can sell. If my next album turns out really well, though, I’ll think seriously about making vinyl copies, even if I have to pre-sell most of them before getting them pressed. My RPM album was meant to be a source of rough new material that I could then sort through and rework in to a few proper tracks, but now I’m not so sure about doing that. These tracks aren’t as rough as I expected, and putting them together in to an album has given them a real sense of finality, so I think I’d prefer to move on to something entirely new. I have some ideas, but whatever comes next, I plan to approach it in a more RPM-like fashion, sketching out a bunch of tracks and then deciding what works and what doesn’t. My earlier tracks were all written, recorded, and mixed from start to finish in isolation, one-at-a-time, and I think that shows. With all of my tracks completed, only one step remained before I could submit my work to RPM Headquarters: turning my collection of tracks in to an album and burning it to CD. A good album can be more than the sum of its tracks, so it was important for me to do what I could within the time limit to bring the tracks together as a cohesive whole and then present that within a proper CD case. I started thinking about track ordering about half-way through the challenge, though I didn’t put much time in to it until I finished all of the tracks. Some of them fell in to place: I knew I wanted to finish with escape velocity and magnificent desolation, and periapsis seemed like a good opener, while I placed free return at track 3 (the “lead single” slot), and I saved track 6 for the upbeat direct ascent, to start the second half of the album with a bang. For the other tracks, I used a bit of trial and error, slotting them in where I thought they’d fit. The end result is that the first half is generally a bit more relaxed and downbeat, while the second half is a bit more lively and upbeat. Despite the time constraints, I did spend some time on the final CD contents. I had planned to just burn each track to CD, using Brasero, but when I played the tracks back-to-back, they didn’t flow together well: the volume levels jumped around from track to track, and the pauses between tracks were too short. I figured the best way to tackle this was to import my finished tracks in to a new Ardour session and make use of Ardour’s CD mastering features. Within Ardour, it was easy to adjust the timing and volume levels between tracks to make them all flow together; I then just had to add CD track markers at the start of each track. I used my ears to adjust those relative volumes, and I had no time (and no real desire, either) to use compression to bring up the baseline loudness, so some of the tracks look much quieter than others if you look at the CD’s waveform; the chiptune tracks, for instance, seemed much louder than their waveforms suggested, so I turned those down quite a bit. Another advantage to mastering a CD in Ardour is the ease with which you can run tracks together without a pause in between. I couldn’t resist the urge to try this, so I brought the start of eclipse up to just before the end of free return. It’s great to hear that seamless transition between the two tracks while listening to the CD (or to the FLACs, in a player like Aqualung). It was important to me to have an attractive CD cover design, and that design started with the cover art itself. The “far side of the mün” concept came the downtime I’d spent playing Kerbal Space Program and listening to MOON8, a brilliant NES reinterpretation of Pink Floyd’s Dark Side of the Moon. A KSP screenshot seemed fitting as a cover, so I fired it up, flew in to Münar orbit, disabled the HUD, and started grabbing shots until I got one I was happy with. To turn that in to a CD jewel case cover, I used Inkscape, along with some excellent SVG templates. Inkscape’s a vector drawing package, so it’s well suited to this sort of design and layout work, and having a template made it easy to size everything correctly. I exported the completed templates to PDF files, and then had them printed on gloss paper and cut to size at an office supply shop. Unfortunately, there wasn’t much I could do for the CD itself — that was just a standard blank CD-R, with “far side of the mün” scrawled on it in black Sharpie! 109:43:18 Armstrong: Isn’t that something! Magnificent sight out here. This track was the perfect bookend for this project: I started it way back on day 3, but it was the very last track I finished, on day 28. It was also a real problem child — the descending bassline motif was there from the start, but despite several attempts I just couldn’t work out how to develop it in to a complete track. It also didn’t seem to fit in with anything else on the album, so even though I really liked the initial idea, I wasn’t sure it’d make it on to the album. Inspiration struck when I decided that it could work as the closing track of the album, a little mood piece to leave things on that bittersweet note that I seem to love so much. With that decision made, everything else fell in to place: it didn’t have to be long, and I could use vinyl-like effects to make it sound overly vintage, which somehow has the effect of making a lonely piece of music sound even more lonely. Once I’d decided on that direction, there was only one name I could ever give to this track. Buzz Aldrin’s first words on the Moon aren’t as famous as Neil Armstrong’s, of course, but I’ve always found them far more poignant — they so succinctly express how strange it must’ve felt to look out across a landscape that’s simultaneously full of beautiful and devoid of life. The piano recording was a live improvisation based upon that descending bassline, which I cleaned up a little in Ardour after the fact; the piano was of course Pianoteq, running in to a convolution reverb (using the IR LV2 plugin). For the vinyl sound, I tried the VyNil plugin, and it did make things sound suitably vintage, but the vinyl surface noise was essentially white noise with random pops, and I wanted more a cyclic popping sound, like you’d get when a needle hits the same scratches on each revolution. Instead, I used an EQ to kill the highs and the lows, which instantly makes something sound old-timey, and then added a vinyl noise sample from Freesound, which I looped for the length of the track. Adding just a little vibrato (using TAP Vibrato) to simulate the sound of a slightly warped record helped to complete the vintage feel. 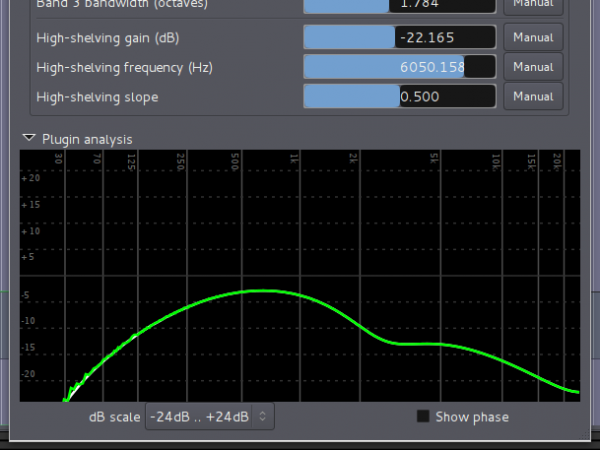 Cutting away high and low frequencies, as shown in this plugin frequency response graph, goes a long way to making something sound "old"
Fading between the “vinyl” piano and the unprocessed piano was more tricky than I initially expected. The idea was simple enough: I disconnected the piano track from the master bus and routed it in to two new buses — one with the EQ and vibrato plugins, and one without — and then faded each bus in and out as required. I used automation to disable the vibrato (moving its “depth” to 0%) to prevent chorusing effects while both the “old” and “new” buses were playing mid-fade, but even so, the fades didn’t sound right. As it turns out, the TAP Vibrato plugin adds latency as part of its processing, so the “old” piano bus was tens of milliseconds behind the “new” piano bus, causing an echoing effect instead of a smooth transition from one sound to the other. 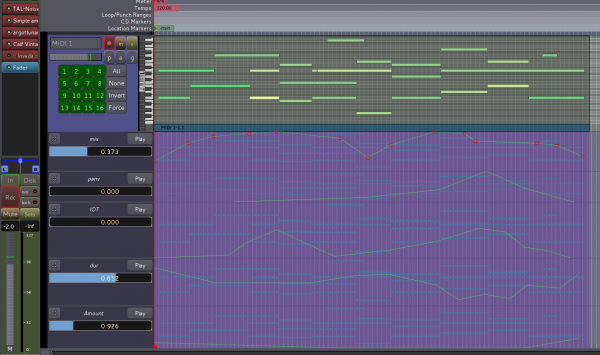 The solution was easy, once it occurred to me: I moved the vibrato to the piano track itself, so its latency affected both buses equally, and then used automation to set its depth to 0% during the “new” parts of the song. It’s worth mentioning that Ardour does compensate automatically for plugin latency on audio tracks. If I’d recorded the piano to audio, and then copied and pasted it across two audio tracks instead of using buses, then these issues wouldn’t occur, assuming that the plugin advertises its latency correctly. I wish I could’ve done a better job of the actual piano arrangement in this — it needs to be properly composed and written down, and then handed to someone with more skill on the keyboard than me — but I’m really happy with its overall feel, and the impression that it leaves me with every time I hear it at the end of the album. A good final track can really help an album make a mark on people, and I think this track manages that. I had no intention of putting an industrial track on this album — or of ever writing one, to be honest — but serendipity is a funny thing sometimes. While working on oberth I took some time out to play with some patches on the Blofeld, and I found a nice arpeggiated lead patch that went mad when I started playing with the filter cutoff and resonance. It became a thumping kick drum, with higher notes giving a more subdued sound, and lower notes sounding brighter, so playing arpeggios resulted in some crazy, but interesting, kick drum patterns. With some drums recorded, I wasn’t sure what to do next, but a distorted bass (TAL NoiseMaker with TAP TubeWarmth) seemed like a good idea. I then added an arpeggio part (TAL NoiseMaker with TAP TubeWarmth again), which was initially continuous, and then tried to add some progression by adding some cutoff automation and a breakdown toward the end. However, I wasn’t pleased with the results (that’s putting it mildly, in fact! ), and I came very close to scrapping it and hoping that I’d have time to come up with something better to replace it. Eventually, it occurred to me that adopting a two-bars-on, two-bars-off pattern for the arpeggio would help a lot. That pattern fit in well with the existing bass line, and it opened up some space that I could fill with random crazyness from the Blofeld. I created a patch featuring heavy distortion (almost to the point of atonality), and then just played a few notes that fit in with the bass and arpeggio, flipping the modwheel (mapped to the filter cutoff) back and forth to go from low, rumbling gurgles through to crazy screams. I did like the breakdown in my initial cut, but I thought it needed something extra, so I tried a trick that I used on texel — I added a Decimator plugin and used automation to bring the “bits” value right down in some places, which causes some really wild, crunchy distortion. The final touch was to add some extra drums, and I went for the easiest, most cliched option — a 909 kit — but with an Invada Tube Distortion to give it some edge. After the overhaul, I still wasn’t completely happy with this track, but it was definitely in much better shape, and good enough to go on the album. It was fun creating such distorted sounds, but I’m not sure if I’ll be in a hurry to follow up with more industrial tracks. Though it’s a close-run competition with hohmann, I think this was the fastest of all the tracks to record — I sat down on day 11 and within a couple of hours, it was finished. This was really just an excuse to play with Argotlunar, a real-time granular processor that runs as a native VST plugin. 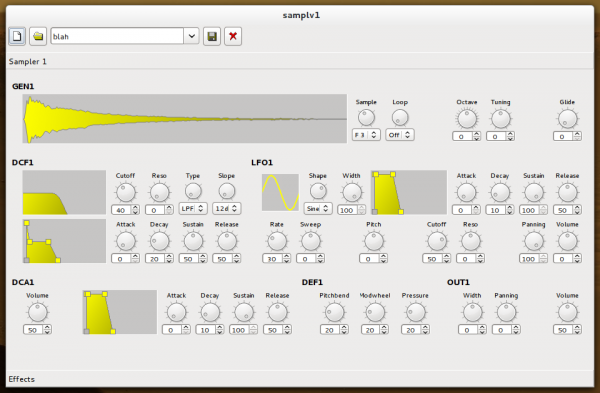 While Loomer Cumulus works on pre-recorded samples, Argotlunar works in real-time on whatever audio you run through it, so it’s great for adding glitchy, cloudy, distorted granular effects to instruments. In this case, I created a suitable pad sound using TAL NoiseMaker, recorded some improvised chords in to Ardour, and then tweaked Argotlunar’s settings to see what effects I could produce. Most of the time I spent working on this track was in automating Argotlunar’s settings, shifting through different ranges of settings to create different effects. I also added a Calf Vintage Delay, mainly toward the end, to give things a little more space. There’s not a lot more to say about this; it’s a simple track, but it does its job. Argotlunar was great fun to play with, and it creates some interesting sounds, but I don’t think there’s quite enough variation on it to really justify its length — it could easily be a minute shorter without losing anything. It does at least work well as a change of pace before heading in to escape velocity. I’d been wanting to write something in 6/8 for a while, and RPM seemed like as good a time as any to give it a go. I started this track by creating a simple triplet beat in Ardour, using the Hydrogen 909 kit, and then playing with ideas for a looping bassline using TAL NoiseMaker. 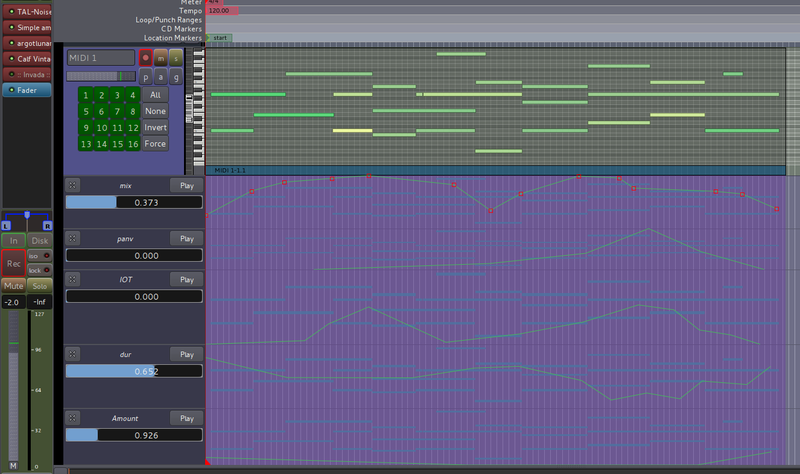 Once I had a bassline, I added a simple pad part. Initially, I used presets for the bass and pad sounds, but they didn’t quite fit the sound I was after, so I soon replaced them with my own patches. 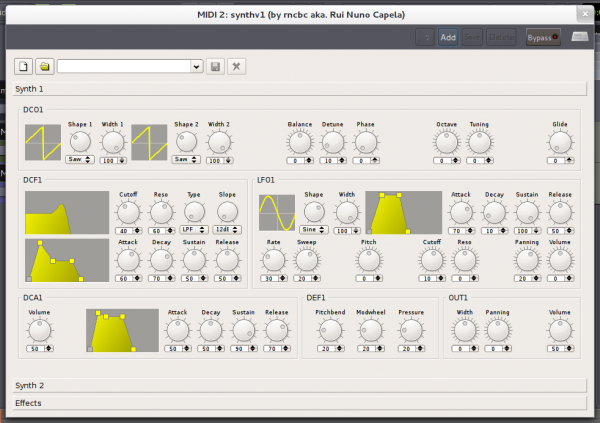 Even though I used a Hydrogen kit, I didn’t use Hydrogen to load it at first — instead, I used a new LV2 synth called DrMr, which works with Hydrogen drum kits. It’s early days for DrMr, and it’s promising, but I ended up swapping back to Hydrogen when I discovered that DrMr doesn’t yet respond properly to velocity information. With the bass and pad in place (with some cutoff automation to spice them up), and the drums fleshed out a bit, I added the arpeggio part, using a TAL NoiseMaker preset, and then the lead, using a proggy patch on the Blofeld. After my experiences on tracks like hohmann, I wasn’t shy about using the pitch bender here, but I think it helps breathe some life in to the lead part, and makes the whole thing sound a bit like a Jean Michel Jarre track. This was one of the last tracks I worked on; I started it on day 22, and wrapped it up at the start of my final sprint, on day 27. I wasn’t quite happy with the drums (I don’t think that 909 kit works as well here as it did on periapsis), but everything else came together pretty well. It’s not particularly outstanding, but it’s a good, solid track.